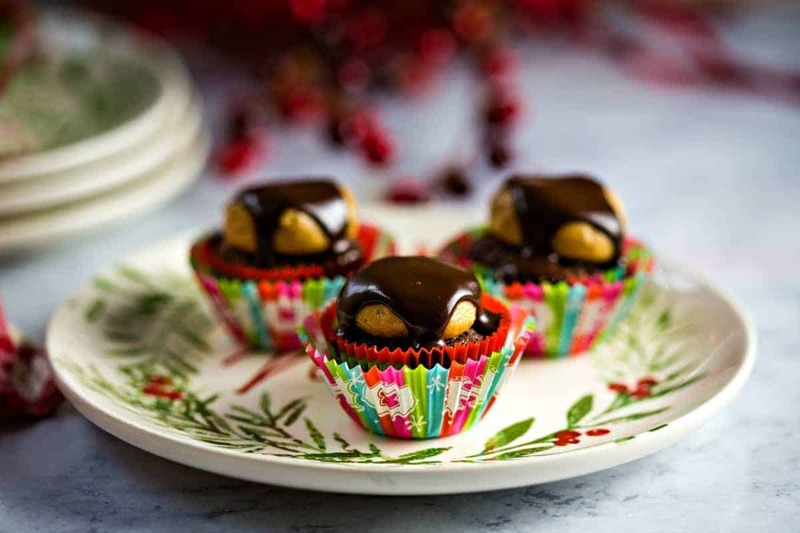 Buckeye Brownie Bites — miniature brownies topped with peanut butter “buckeye” candy balls and drizzled with dark chocolate ganache — are a fun dessert for holiday parties or for sharing at Christmas cookie swaps. One recipe batch makes 32 bite-size treats, so there are plenty to package in gift boxes or treat bags. 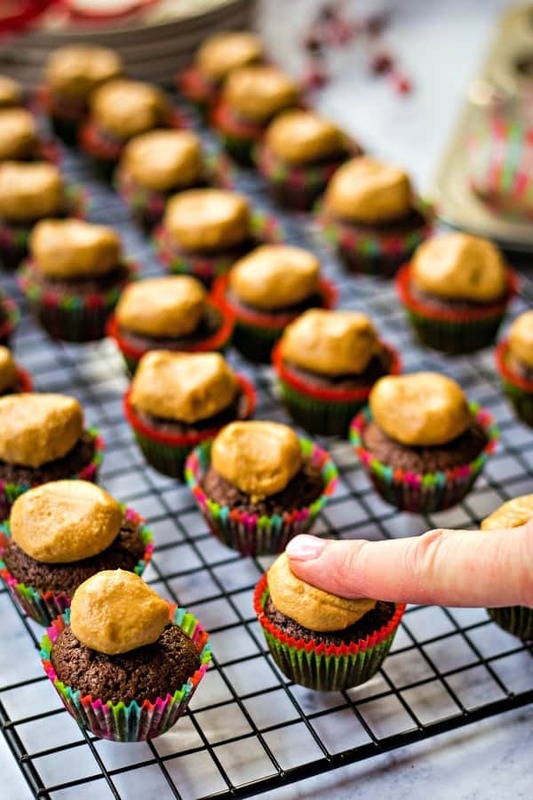 Bake these little buckeye brownie cupcakes in festive miniature paper baking cups and you have a pretty party tray that will be popular with any crowd. With peanut butter and chocolate how could you go wrong? 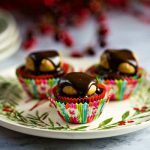 I’m sharing Buckeye Brownie Bites as part of The Sweetest Season Cookie Exchange, a yearly collaboration by food bloggers to raise money and awareness for the Cookies for Kids’ Cancer charity. This season is not just about receiving gifts under our tree, but about giving back. My blogging friends and I are raising money for Cookies for Kids’ Cancer through the end of December! I hope you’ll consider helping us with this worthy cause! Cookies for Kids’ Cancer is a recognized 501(c)3 non-profit organization dedicated to funding research for new, innovative and less-toxic treatments for childhood cancer. Since 2008, Cookies for Kids’ Cancer has granted nearly $15 million to pediatric cancer research in the form of 100 research grants to leading pediatric cancer centers across the country. From these 100 grants have stemmed 37 treatments available to kids battling cancer TODAY. 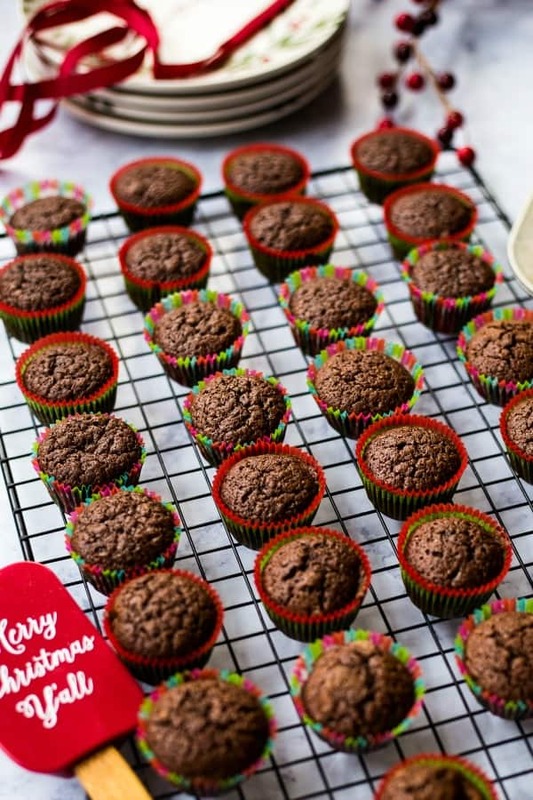 To make this recipe, first you’ll need miniature muffin pans and miniature paper baking liners. The recipe below is for a homemade brownie batter, but you could substitute your favorite boxed mix if you’re short on time. Once the brownies have baked, allow them to cool completely on wire racks. Mix together the ingredients for the peanut butter balls until smooth and creamy. Using the palms of your hands, roll the mixture into equal-size balls and place one on top of each brownie. Press down firmly with your finger to make a slight indention and to spread it a bit over the brownie (don’t worry about it covering the entire top). 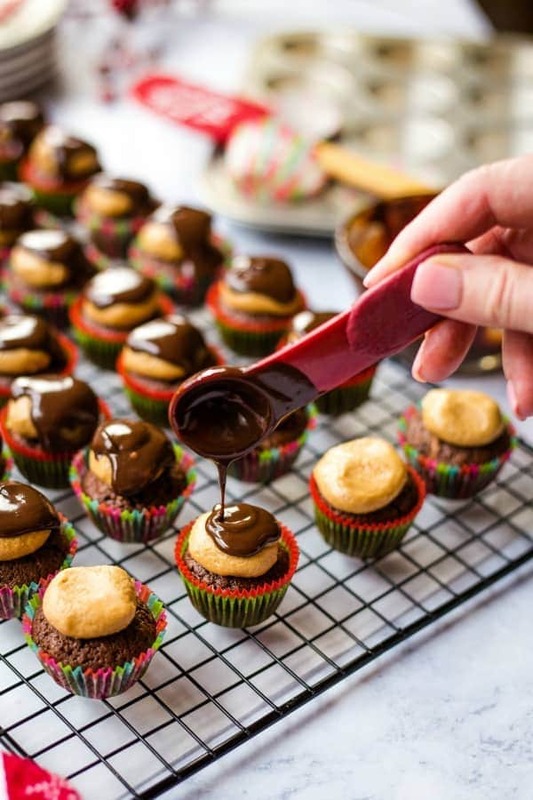 Make the ganache and drizzle a teaspoon or so on top of the peanut butter balls, allowing it to spill over onto the brownies while leaving some peanut butter showing. Place the Buckeye Brownie Bites on a tray uncovered in the refrigerator for 10 minutes or until the chocolate sets. Why support Cookies for Kids’ Cancer? Cancer is the #1 cause of death by disease of children in the U.S. The National Cancer Institute’s (NCI) federal budget was $4.6 billion. Of that, breast cancer received 12 percent, prostate cancer received 7 percent, and all 12 major groups of pediatric cancers combined received less than 4 percent. Two-thirds of pediatric cancer patients will develop long-term side effects — many life-threatening — a result of the treatments that “cured” them. Only 4 of the 12 most common types of childhood cancers have average survival rates over 80 percent. 40,000 U.S. children are actively battling cancer right now. You can help fund cancer research specifically for kids at The Sweetest Season fundraising page. Thanks for your generosity! The traditional Buckeye candy got its name because it resembles the nut that comes from the Ohio buckeye tree. Over the years, this candy has become very popular during the holidays. Adding them to a delicious little brownie makes a fun dessert for any holiday party tray. 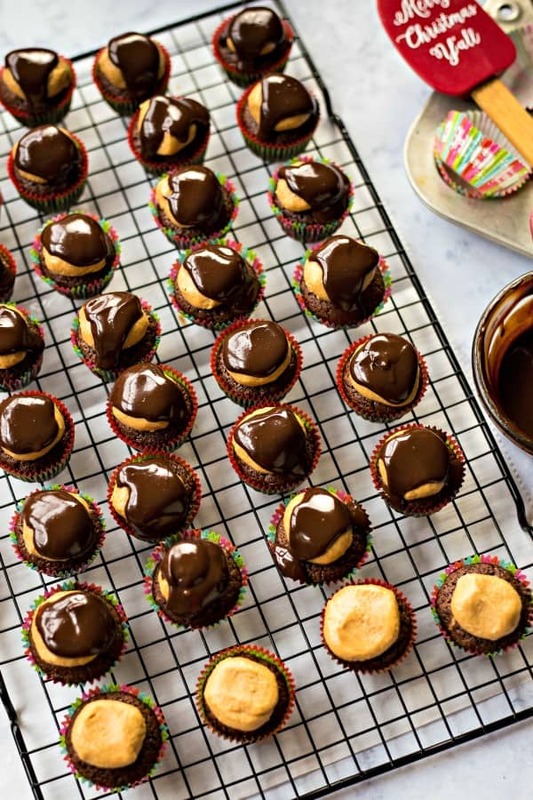 DID YOU MAKE THIS BUCKEYE BROWNIE BITES RECIPE? 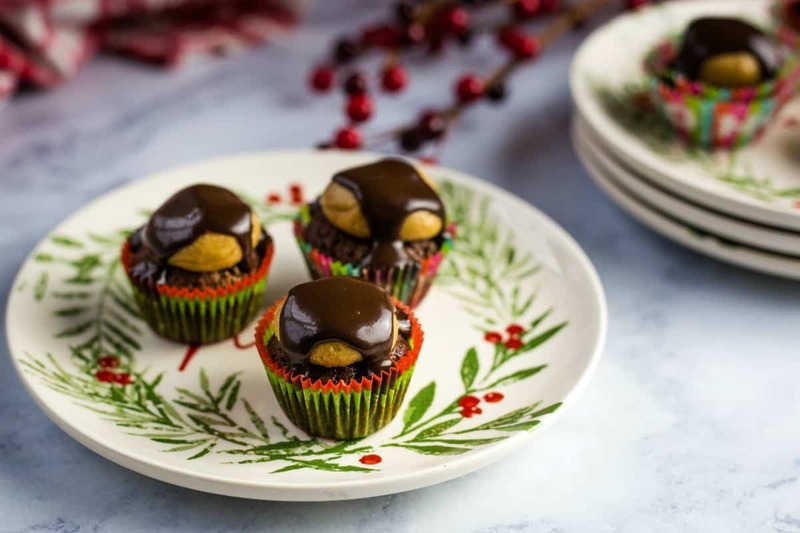 Buckeye Brownie Bites — miniature brownies topped with a peanut butter "buckeye" candy ball drizzled with dark chocolate ganache. Preheat oven to 350 degrees. Place 32 paper liners in miniature muffin pans. Place butter and chocolate chips in a microwave-safe bowl and heat on HIGH for 1 minute. Remove from microwave and stir until chocolate and butter are melted. Add 1/2 teaspoon vanilla, the brown and white sugars, and two eggs, whisking until fulling incorporated. In a separate bowl, combine flour and baking powder. Gradually add to chocolate mixture. Carefully place a level 1 tablespoon of batter into each muffin cup. Bake for 13-15 minutes, until brownies spring back when touched. Cool in pans for 5 minutes, then remove to a wire rack to cool completely. Using an electric mixer, cream together the ingredients for the peanut butter balls until smooth. Roll mixture into 32 balls. Place on top of cooled brownies and press down slightly with your finger. Place 1/2 cup chocolate chips in a small glass bowl. Heat cream in microwave for 20-30 seconds until hot—but not boiling—then pour over chocolate. Allow to sit for 5 minutes, then stir until smooth. Spoon 1 teaspoon of ganache over each of the peanut butter balls. Place in refrigerator for 10 minutes to let chocolate set.